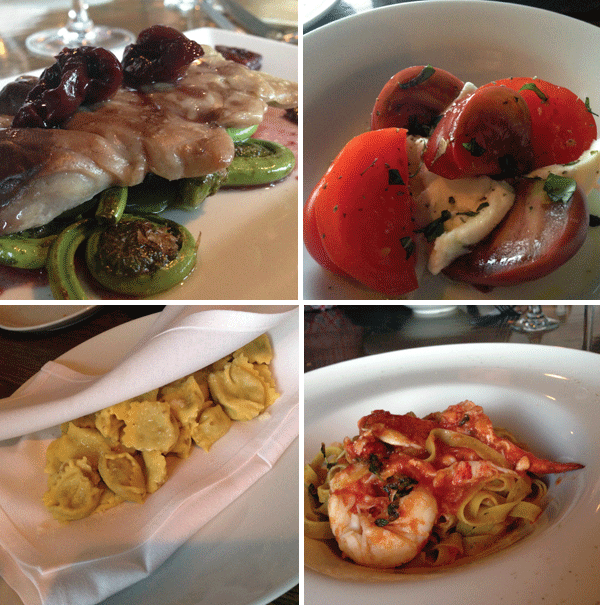 Last weekend we finally made our way to Beverly’s Pride’s Osteria, a place that has been generating some serious buzz. Perhaps our expectations were high, but it ended up being an odd experience. The dining room was a bit stark and became very loud by evening’s end, making it difficult to converse. (Surprisingly, the bar area was much quieter.) The waitstaff, however, was perky and helpful. Although the Montenegro Manhattan (made with Amaro Montenegro) was excellent, we were not impressed with skimpy wine pours, and we noted that many of the drinks were $1 more than the online menu prices. We enjoyed the light, crispy focaccia, served with fruity olive oil for dipping, as well as the lightly smoked local bluefish with Maine fiddleheads and house-made cherry vinegar ($12). The dressing was tangy, and the fiddleheads were fresh and crunchy. The Tagliere del contadino (farm board) featured artisan meats, cheeses, and bread and was tasty, but the half portion was tiny for $14. Also meager was the caprese con mozzerella di bufala. While the heirloom tomato slices and imported mozzarella were fresh and flavorful, the dish was not worth $14. For entrees, we all opted for pasta, hand made by chef Paolo Laboa. The piedmontese style angnolotti filled with red wine, braised pork, beef, and sausage was the favorite; the little pillows served warm between the folds of a cloth napkin were tender and meaty ($22). The other two dishes featured pasta with great texture, but the sauces underwhelmed us. The much-touted, award-winning pesto ($20) was silky but otherwise quite ordinary. The piccaggette pasta with lobster ($22) suffered in the translation. The Italian “alla Maggiorana,” I realized after Googling, is a marjoram preparation, but the menu described it as a “light, fresh organic tomato sauce.” The sparse, slightly bitter sauce that accompanied the dish didn’t meet that expectation. Fortunately, we enjoyed a sweet ending to the meal. The house-made latte dolce were fabulous deep-fried, cream-filled dough bites that were amazing and addictive. The restaurant offers diners a shot of home-made liqueur at the end of the meal, and the limoncello was superb. In all, we found the visit a disappointment. There were some memorable tastes, but some real duds as well, and all the portions were very small for the price. We had a wonderful meal and experience at Prides on our visit there last month. Your review perplexes us. Might there be an underlying reason you were so unhappy? I still dream of the Pesto. 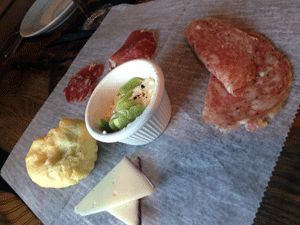 The Farm board we had was a nice prelude to the meal not a meal in itself. Sorry you had such a bad experience ours was A+ ! I wish I woulda read this before we went night before last. Underwhelming to say the least. If someone opens up a restaurant and pimp it as a Farm To Table Locavore joint do the pretentious foodie bloggers automatically have to give it huge thumbs up or they will be ostracized by their other pretentious foodie blogger buddies? Because if that’s the case I’m gonna open up a place serve tiny martinis, tiny portions, charge ALL the money, make everything ala carte and convince everyone that less is more while watching dopey food bloggers trip over themselves to anoint my joint the next best thing. Thank you girls from NSD for giving us the straight dope and that’s why no one should ever question your credibility as unbiased intelligent restaurant critics. John, I’m happy to hear you enjoyed your meal. Our experience wasn’t bad, just not what was expected. The waitstaff were lovely and much of what we tasted quite nice, but we felt the price to portion ratio was uneven. I’ve heard raves from good friends about the pesto, but it just wasn’t a favorite of ours—obviously everyone has different tastes. Thank you for taking the time to write, we really appreciate reader feedback.